Words and Music: "From S. S. Hosanna, by Permission." Source: John Clark Hollister, ed., The Sunday-School Service and Tune Book (New York: E. P. Dutton and Company, 1863, 1865), #17, p. 36.
Who left the realms of glory. And came to dwell on earth! And raised to God on high. He claimed them for his own. So good, so kind, so mild! A young though sinful child. To know and praise Him there. 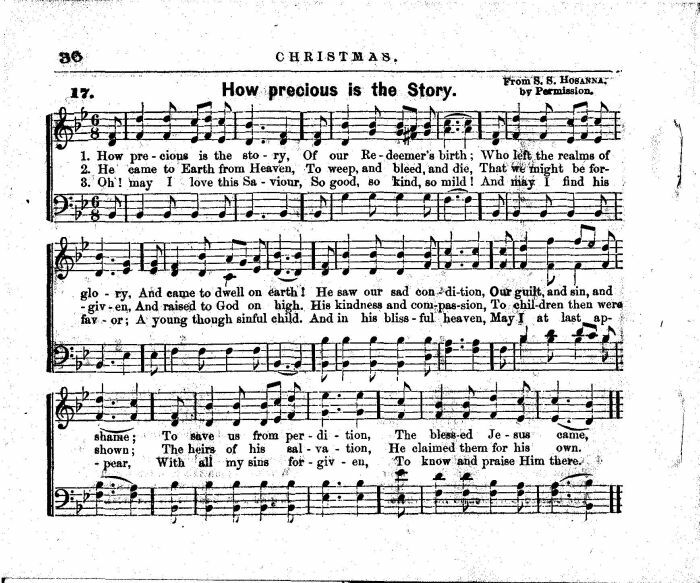 Sheet Music from John Clark Hollister, ed., The Sunday-School Service and Tune Book (New York: E. P. Dutton and Company, 1863, 1865), #17, p. 36.